This is what I wore on May 31st. Friday after work I went out with a friend for A drink which turned into THREE when it started to pour rain. After the rain stopped I tawdled home and found myself eating tacos at a wine bar after I stopped to pat a dog in a doorway. Whoops. Hence, this post is a little late. I decided to wear a tank top underneath this to provide more coverage without having to wear a cardigan like I did last time. I love how flowy this skirt is. This will probably be my favourite summer dress. I could wear a nice crinoline under this on days that aren't 30C, as it was on Friday. And since these shoes have skulls on them I tried to make my bling match. That is the perfect summer dress, and would look amazing with a crinoline! 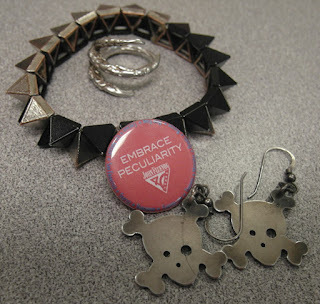 Peculiarity rocks! Whoa, with skirts that swishy it would put a little more sashay in the way a girl walked. Drinks? Dogs? Tacos? Sounds like Toronto is a fun place to do whatever comes along! I would love a close-up of those sandals next time - I can't really see the skulls. I had a great weekend - we've been having the best weather! The highlight was riding along the bike trails by the river, seeing two women fishing and singing. Just a lovely moment. 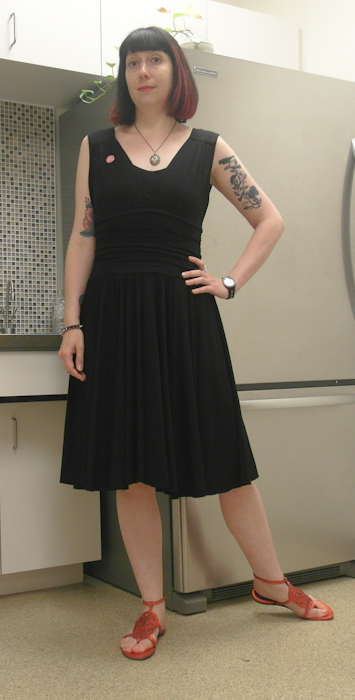 Possibly a perfect little black dress. Can't go wrong there! Flowy, flowy, swoosh and flow. Best kind of dress, and I love the spontaneity of your evening. oh yes, I can remember that kind of nights when I was out just for a drink, ahem!. Your flowy dress and pretty sandals look very appropriate for that 30C, love that flowy sensation when walking! This dress looks great on you. In fact I love many of your dresses and shoes in the older posts. You have great style!